Teleconferencing Services can provide trouble-free multi-point video conferences to anyone with standards-based video conferencing equipment. Our video conference services include multi-point conference bridging over a variety of network options, point-to-point conference launching, scheduling, and resource reservation. Our outstanding multi-point service features include voice activated switching, continuous presence, speed matching, universal conference control, chair control, audio add-on, T-120 application sharing, and an audio operator who meets, greets and monitors your event. Teleconferencing Services provides video conference technical support services around the clock and around the calendar for scheduled video conferences. 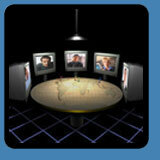 Customer care is a proactive key feature of our video conferencing service. Each customer has a designated customer care advocate who is responsible for monitoring and managing each conference . . . special care from Teleconferencing Services bringing you additional peace of mind.